This small video shows how particles pour out of vehicles. It shows a heat camera focusing on the particles that are released when cars and other vehicles are often parked or moving around a school premise. It sadly also shows how children, who, because of their petite body structures are more prone to the pollution caused by these vehicles. The Particulate matter that is produced by these vehicles or any other vehicle parked outside a school can be extremely dangerous to the children who could often be found in the playground. The video also features little children who cutely confess and educate people about the bad effects of Air Pollution. 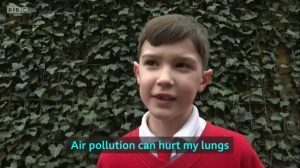 The video warns that the effects of Air Pollution are going to be more harmful than what they had previously predicted. Illness, asthma and major harm to the lungs is only the beginning, BBC’s Science Editor, David Shukman explains how it can also be directly linked to the most disastrous brain damages that are known to mankind. In a few frames only he asks us to imagine the tiny particles which are invisible to us, but really dangerous once they reach into the blood-stream. The video in a pretty metaphorical conclusion also claims that only greenery and proper precaution can help us fight the impending disaster.